So they are banning students from putting their hands up. Hmm…. Let’s call it the Hermione Granger Effect. 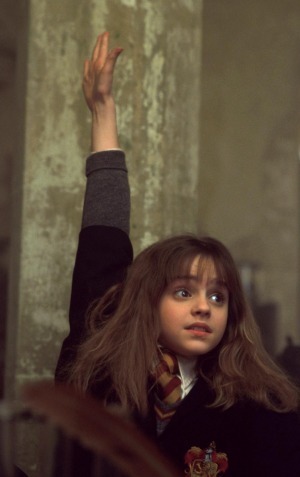 Every classroom has at least one Hermione, the pupil who always raises their hand to prove they have the right answer. At the back of the class, kids are quickly switching off. But some Victorian schools are banning students from putting their hands up in classrooms, as part of a progressive global experiment in changing how classes are run. Toorak College and Frankston High School are among Victorian schools taking up the no hands-up policy, along with other schools in Europe. Derinya Primary School is also considering the approach – the brainchild of renowned British education expert Professor Dylan William. The theory is that the same minority of top students are raising their hands to answer teachers’ questions, and are getting smarter with each response, widening the gaps between the high and low performing students. Having the smart kids answer every question can fool teachers into believing that the whole classroom – as opposed to those more vocal – are learning.